Thanks for looking and leaving comments, have a good weekend. This is what i have put on the inside. 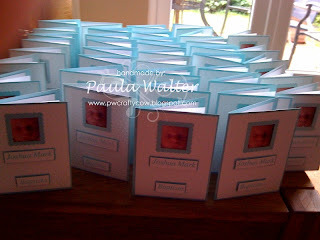 Below are the fifty completed cards ready for sending out. 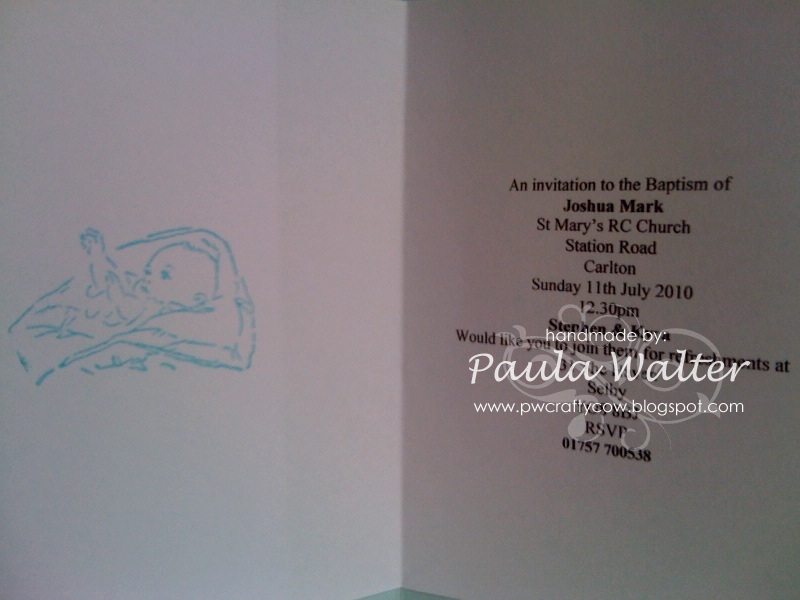 plenty of time to put the date of the baptism in their diarys. Thanks for looking hope you all have a nice weekend. 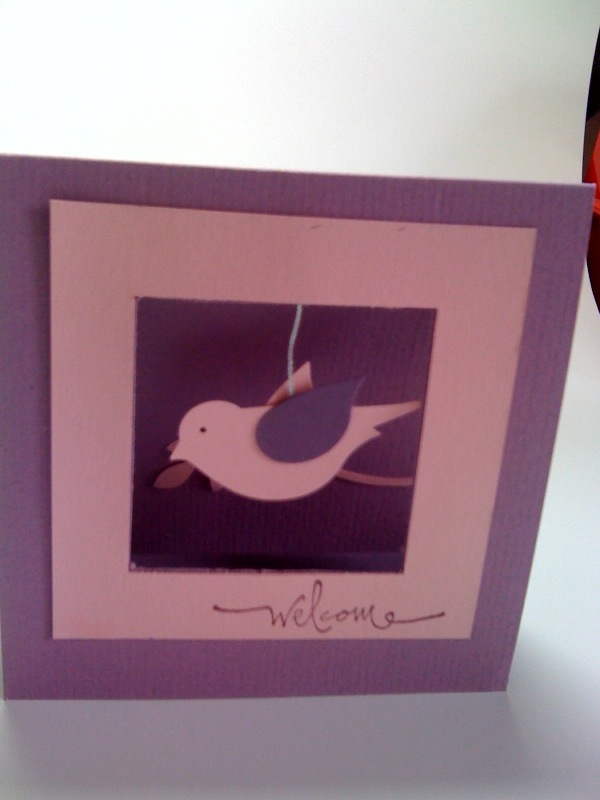 Would you like to join my Stampin' Up team and get your stamping products at a discount? 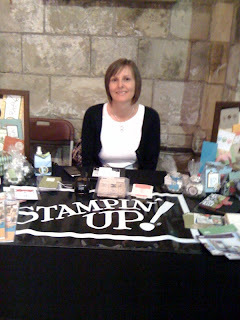 Please contact me and i will give you details on becoming a Stampin' Up Demonstrator! Stampin' Up offers something for EVERYONE! Maybe you want to earn some money on the side, working out of your own home. Maybe you don't want to hold workshops, but just want to get products at discount! 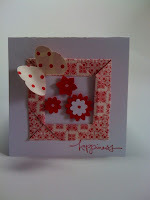 Then Stampin' Up is for you. Contact me for details!!!! I'd Luv to have you join my team. 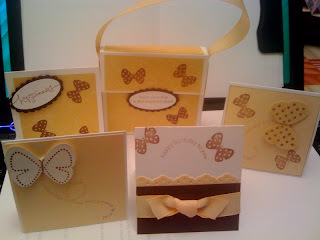 SU Barely Bannana cardstock with whisper white embossed cardstock. I punched out 8 SU oval designer paper ovals, then i folded them in half long ways, then i folded them in again in the middle so that you have 2 openings at one end. 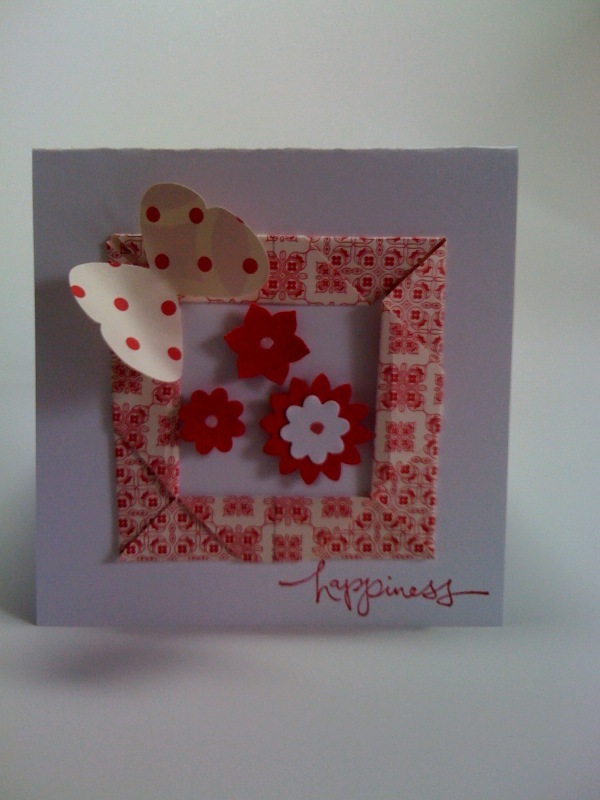 Then put alittle glue on the fold and join them together in the centre you will have a very small opening you could put a bad in the middle to cover it. 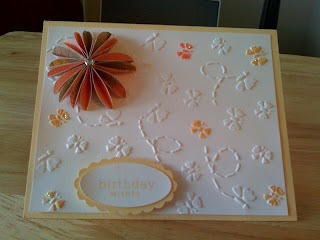 The Oval flower i found on Kazzellscrafts.blogspot.com. 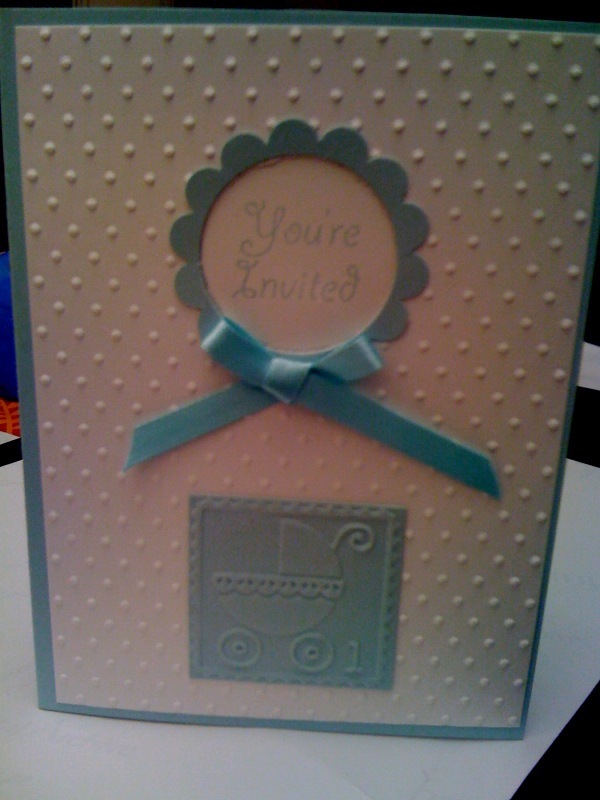 This is the front of the baptism invite that i am making for my grandson. 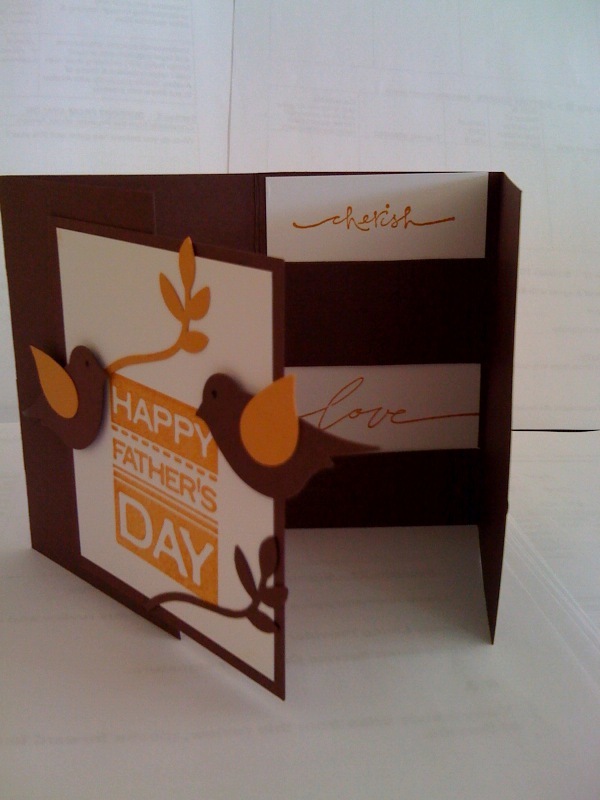 The card was made using SU cardstock cool caribbean that is not available any longer. SU whisper white cardstock that was embossed with a cuttlebug embossing folder. 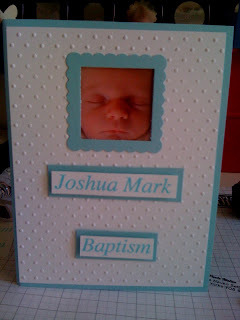 I punched out a scalloped square and then cut out a smaller square for Joshua's little face. 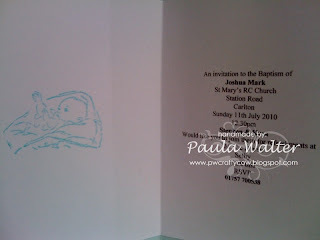 I had the Joshua Mark and Baptism stamps made for me by a small company in York. Now all i have to do is make 50 by next Friday. Thanks for looking hope you all have a nice weekend with the fab weather. One lady that joined my class last week asked if i would hold a class weekly. I agreed to do this thinking that maybe i could attract others to come on any of these Wednesday's. Today the projects she made are pictured below. I used white SU cardstock and SU designer paper to make the bag, SU cardstock to make the card with the same SU designer paper for the cards that we made. The lady wanted all identical cards so i have only taken one photo of a card and, of course,the bag!!!! My son Stephen asked me if i would make invites for my grandsons baptism, so i have made one tonight and i will make a few more. Before letting Stephen and Kyra look at them and decided which they would like me to make. 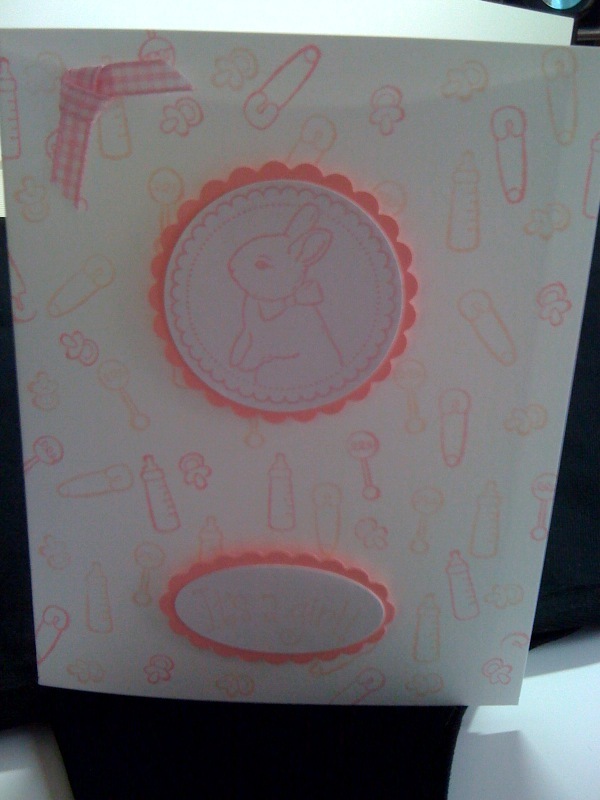 Made a card today and i baby sat for Joshua tonight. Made this card for my hubby to take for a colleague. And tonight i baby sat for my grandson Joshua while his mam and dad went out for a meal. 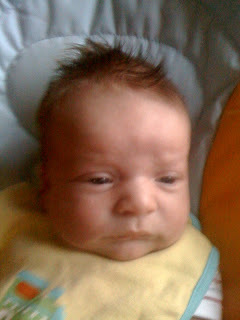 Joshua is now 5 weeks old tomoro he likes to be sat up looking round took this photo with my phone, just to show how he is growing. Well today was my monthly class, i was expecting 3 people and 10 mins before i got a call from one that said her mother was not well so they would not becoming. I was disappointed but the class still went on and we made the set above. 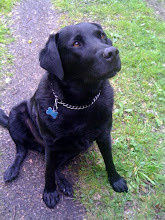 I shall call the lady tomoro and get her address so that i can send a get well card, and hope to see her next month. It was a shame that they did not come because i feel that the daughter would of liked today's goodies. Today i had big ideas of doing lots of jobs around my home. It all went wrong!!!! Firstly I received a call from my youngest sister from Australia and that can usually wipes out at least a couple of hours. While i was on the house phone my mobile rang and it was a friend that was in the area and was going to call in,to catch up, my phone call with my sister ended 5 mins before my mobile rang, and it was another friend, that i was attending a meeting with tonight. They were just making sure about what time we could meet before the meeting to iron out a few issues. 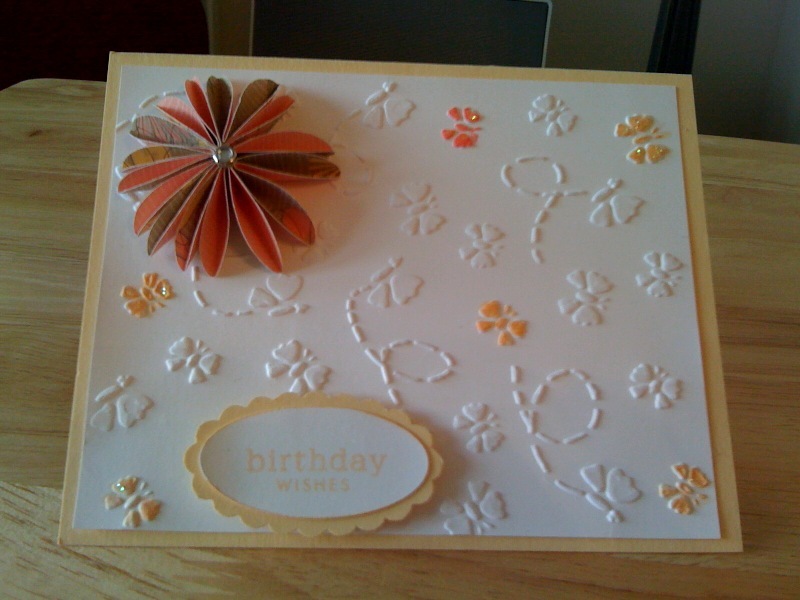 Then my friend came, during us catching up, i just happened to say my sewing machine was playing up so she had a look at it and played around while she did this i made her a card she likes orange and yellow so this is what i made. 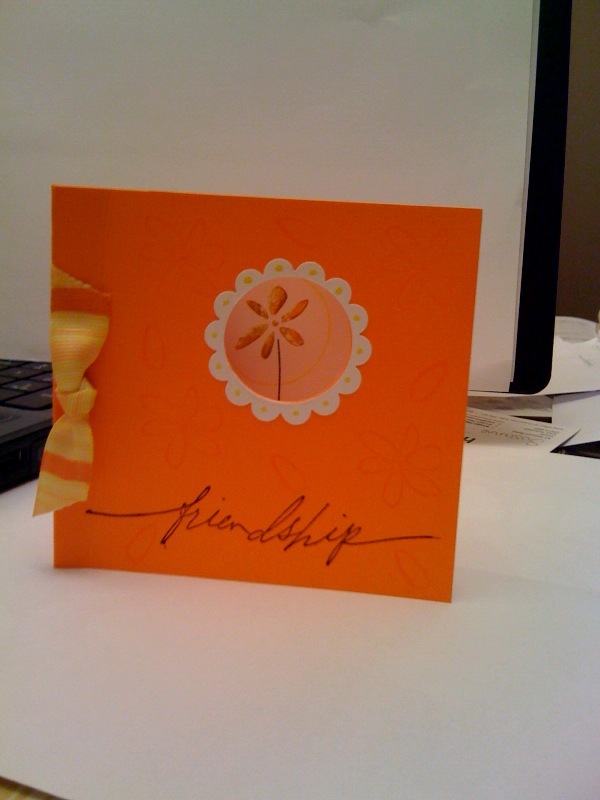 Only orange SU cardstock . Only orange and Yoyo yellow SU write markers. 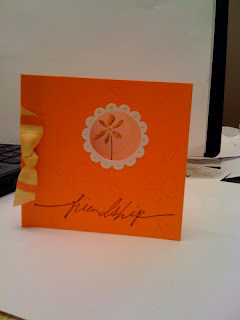 Tomoro i shall use some of SU new cardstock and ink. so just to say this is not my own design. I cut my purple cardstock 4 ins x 4 ins. 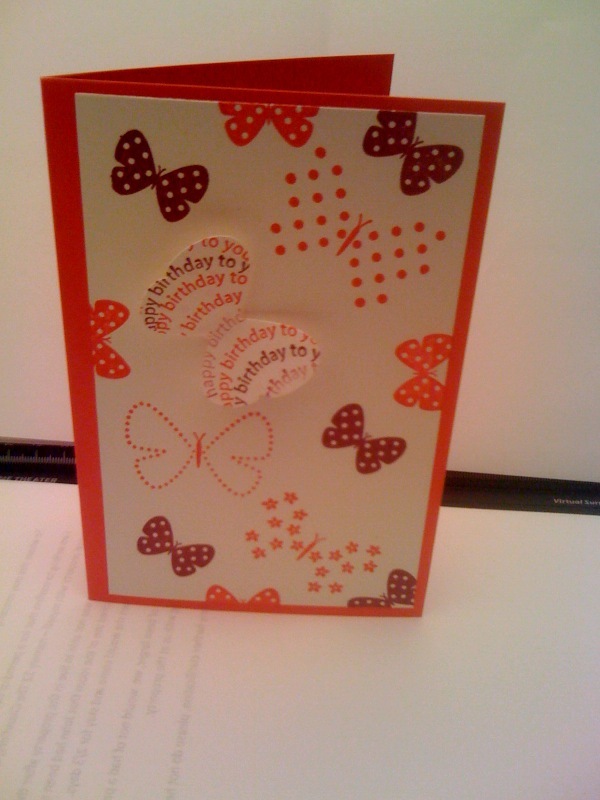 I cut out a 2 1/4 ins x 2 1/4 ins square hole from the middle of my 4 x 4 cardstock. Then i cut out a 2 1/4 ins x 2 1/4 ins square out of the 3ins x 3 ins leaving a border of 3/4 ins x 3/4 ins. and hung it from the top of my card and i glued the leaf and stem to the back of the card. 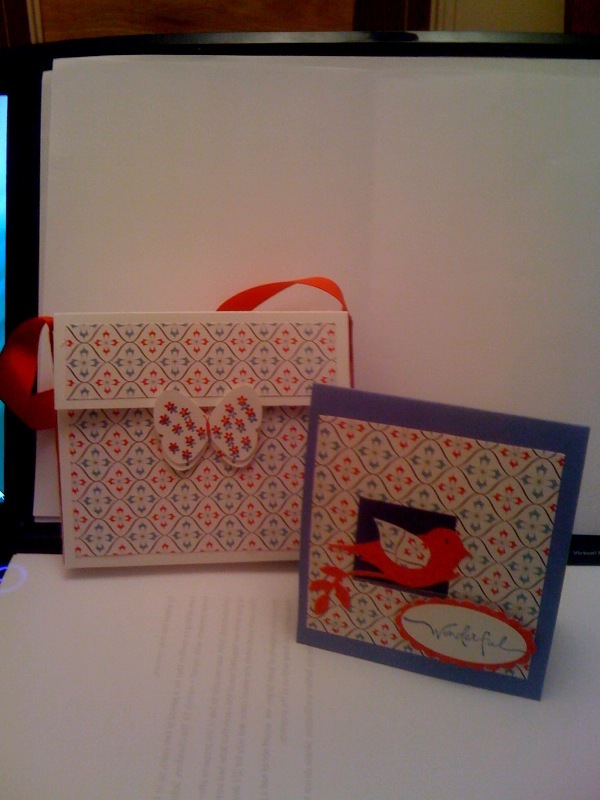 Next i folded my score lines at both 1/2 ins score lines i added glue and stuck each end to my card so now my card can only open 1 1/2 ins. 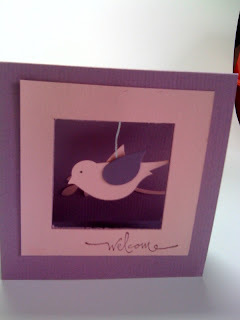 Then i stamped the face of the card with "Welcome"
My Friends daughter gave birth to a little girl, i made this card for her using whisper white, pixie pink cardstock and pixie pink ink pad. 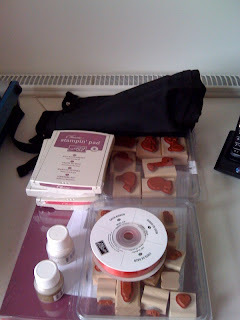 I forgot to tell you that i did not buy any crafting goodies while i was in Manchester, but i think that was because i never saw a craft shop or believe me i would have, for sure, would have bought something. And i did not feel so bad because earlier in the week i had place a SU order. I did not have time to get withdrawal symptoms because today i had a delivery from SU so that was great. My order was for the new colours that SU have just introduced to the UK in May. If you are interested in any of SU products please contact me so i can assist. I'm back from Manchester with my friend. My previous post said i was off to spoil myself.......well i did. We arrived in Manchester in the early afternoon then Jackie and I shopped till we dropped. The hotel was fab and so luxurious. We then went to see the show, "How now Mrs Brown Cow" I have never laughed so much in my life. The show was fantastic. \i recommend anybody who reads this to book and see. After the show we returned to our hotel for a meal and then to bed. This morning we ate then shopped even more than the day before. What a lovely way to spend time with Jackie to celebrate her 60th birthday. ps I spoiled little Joshua again but never mind he is just sooooooooooooooooooooooadorable. Join in a product share! 11 new products are on offer. Would you like to buy them all but its the cost that stops you? Then why not join me in a paper and ribbon share. 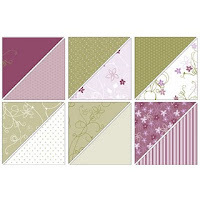 You will recieve 12 sheets of 6x6 cottage designer papers below. On the 27/28th April a friend was holding a fund raising event in Selby Abbey, Jo and i had a stall picture above. We are hoping that by attending such events we maybe able to promote our business interests particularly in respect of Stampin Up! products which we use ourselves. 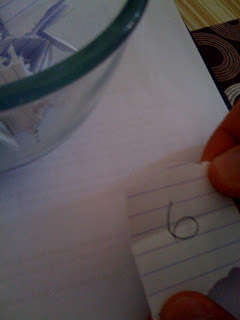 CONGRATULATIONS No 6 Anne you are the winner of the candy. Could you please email me your address so i can post them. Last night we announced that No 38 Pam White was the winner of my Candy. It has been brought to my attention that Pam did not have my Candy linked to her site, which is a requirement to be eligible to enter the draw. This renders the result invalid. 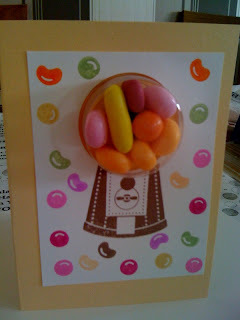 I have sent Pam a message to say that i am sorry but i will have to redraw the blog candy, because she did not link. She was absolutely fine about this and she told me that she is new to blogging and still has a lot to learn.